Daniel Ricciardo has topped the Friday practice timesheets in his upgraded Red Bull Racing car at the Hungarian Grand Prix. Both practice sessions were scrappy affairs, with drivers frequently pushing beyond the available grip as they attempted to discover how fast they could push this year’s high-downforce cars, which are ideally suited to the twisty Hungaroring. Ricciardo, however, didn’t put a foot wrong all day, and the Australian’s time of 1 minute 18.455 seconds — just 0.019 seconds off the all-time lap record — underlined how comfortable he was in his car. The Australian said the team’s first pole position in more than 12 months could be on the cards if the car continues to perform as it did on Friday. 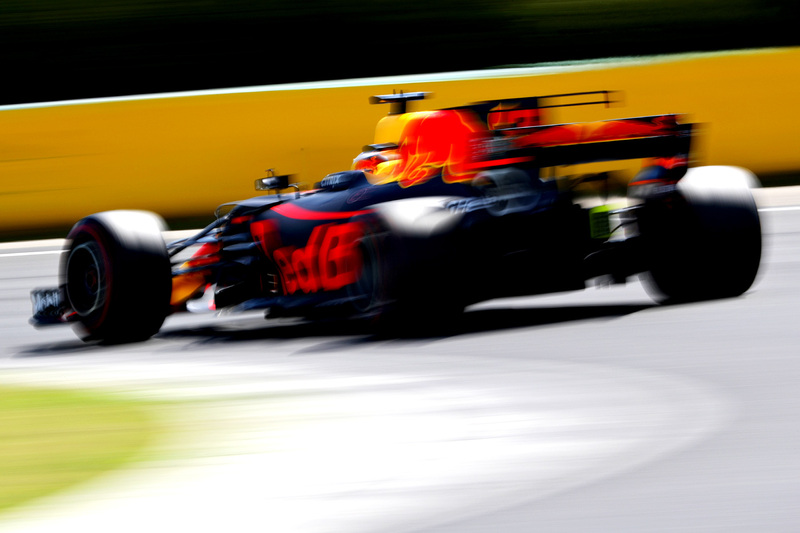 Red Bull Racing typically performs well in Budapest because the Hungaroring circuit neutralises engine power while favouring aerodynamics, an area in which the energy drinks-backed team has always excelled. The team’s Friday performance has foreshadowed a three-team battle for supremacy for the rest of the weekend. Championship leader Sebastian Vettel went a small way to answering questions supposing Ferrari was falling off the pace in the middle of the season, the German lapping just 0.183 seconds shy of Ricciardo’s headline time. Ferrari has brought a new floor to Budapest after the governing body, the FIA, requested amendments be made to the previous iteration to ensure it conformed to the regulations. Mercedes, on the other hand, looked not a bit of the dominant force it was expected to be by the end of the day. Valtteri Bottas led the way for the Silver Arrows with a lap 0.201 seconds off the pace — very much in the mix, but not much more. Ferrari’s Kimi Räikkönen, Mercedes’s Lewis Hamilton and Red Bull Racing’s Max Verstappen were 0.3 seconds off the pace in fourth, fifth and sixth respectively. Hamilton in particular struggled with the balance of his car. The battle for the next-quickest team is as enticing as the fight for the lead, with Renault, McLaren, Toro Rosso and Force India all contending to be the fourth-fastest entry. Hülkenberg set the seventh-quickest time, albeit 1.2 seconds off the pace, but Fernando Alonso put his Honda-powered McLaren just 0.1 seconds behind the yellow car. McLaren deliberately forced the Spaniard to take a plethora of grid penalties for new engine parts at the previous race in England in order to ensure his car’s reliability at the Hungarian circuit, which presents the team with its best chance of points with its underpowered Honda engine. Carlos Sainz led the way for Toro Rosso, setting a time just 0.019 seconds slower than Alonso’s best effort, while Alonso’s teammate, Stoffel Vandoorne, set the tenth-best time less than 0.1 seconds back. The two 90-minute sessions were suspended four times due to crashes, half of which were caused by Jolyon Palmer. Palmer ran wide over the kerbs at turn four at the end of free practice one to end the session early, the Briton breaking his front wing and damaging his brand-new floor in the process. With an old specification floor fitted for the second session, Palmer crashed heavily at the final turn after complaining of poor balance in his car. Palmer is under pressure in Hungary, with former F1 driver Robert Kubica set to test with his Renault team during the week in anticipation of a potential full-time return, perhaps at the Briton’s expense. Pascal Wehrlein also met with the barriers in the second session, the Sauber driver destroying the left-hand side of his car, and Ferrari-backed rookie Antonio Giovinazzi smashed his Haas during the first session. The damage to the Haas was so severe that Kevin Magnussen, whose car Giovinazzi had been commandeered, was able to set just 11 laps after his mechanics finished repairing his car late in free practice two.